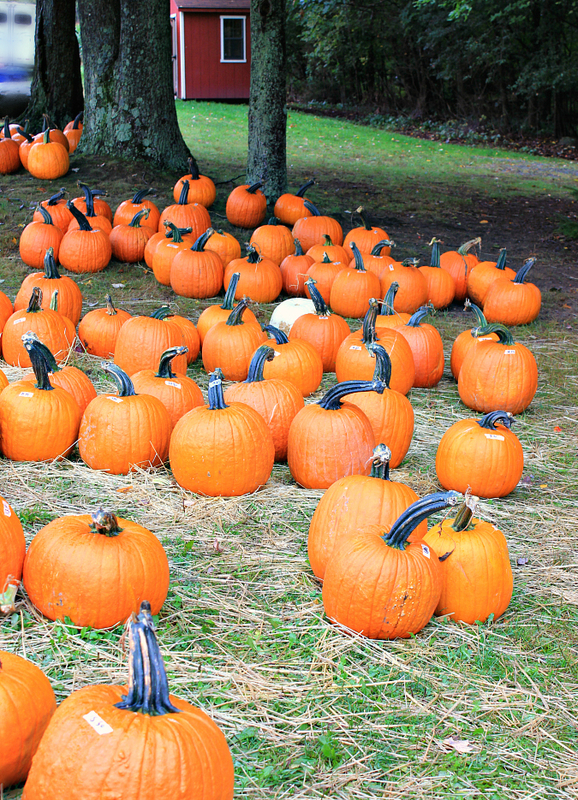 i snapped this picture this past weekend when we were at ritter's cider mill and i love all of the pumpkins lined up ready to be sold with the little red shed in the background. now that we're a week into october, it really feels like fall is in full swing. we have been eating ourselves silly with apples, trying to use up the apples that i picked a few weeks ago. they're still going strong! i'm craving some outdoor fall activities, so i'm really hoping that the weather holds out and that we are done with the gloomy skies and rain for awhile. fingers crossed for some fall fun this weekend! i really want to soak up every minute of it before the leaves fall and autumn disappears. i'm thrilled that it's friday and i'm looking forward to the weekend. having two days off from work sounds glorious after a very hectic week! I love the autumn. It is so colorful and so tasty. Making me hungry for pumpkin squares. Think I will make them.